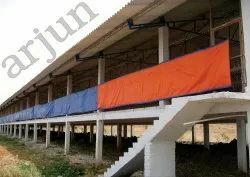 Leading Manufacturer of poultry curtains from Salem. We can customise and supply poultry curtains , suitable to individual customers.. within a days time. we have in different ranges and colours.we have in Blue/Blue. Natural White, Yellow, Leaf Green, Blue/orange, Green/Silver , Black/Black colours in our range..